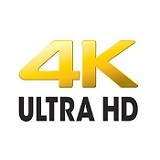 Universal Pictures Home Entertainment (UPHE) today announced plans to release a broad selection of films in 4K Ultra HD, the home entertainment industry’s next-generation physical and digital viewing format making its swift proliferation in market. UPHE will begin a progressive rollout of its growing roster of movie titles around the world beginning this summer, showcasing a mix of new releases, including some of this year’s most-anticipated blockbusters The Huntsman: Winter’s War, Warcraft and Jason Bourne as well as recent hits, such as Everest, Lucy and Lone Survivor, among others. Other 4K Ultra HD offerings in the pipeline will include a selection of IMAX spectacular cinematic films. UNIVERSAL CITY, CA (April 19, 2016) – With more than 100 titles across the industry expected to be available on store shelves to consumers by the end of 2016, UPHE plans to make its titles available in both 4K Ultra HD Blu-ray and 4K Ultra HD digital formats. All of the designated offerings will feature a combination of 4K resolution and the color brilliance of High Dynamic Range, with many additionally including multi-dimensional sound for the ultimate immersive audio experience. UPHE will deliver an enhanced selection of its new release and catalog titles mastered in Dolby Vision™, the high-dynamic-range (HDR) format and playback solution which brings out ultra-vivid colors and more hues across a full range of brightness.